As its name suggests this street was the principal route to the North from Wolverhampton. It ran from Queen Square for roughly three quarters of a mile, and at a time between the wars, it would contain every type of trade and business you could mention, plus two Churches two Schools, nine Pubs, until it reached number ten the ‘Gladstone’ on the Corner of Red Cross Street. It was then renamed North Road and carried on roughly half the distance again passing many other shops, fine Victorian Terraced housing, including a home for unmarried mothers, a Working Mans Club two more pubs until it reached the five ways. Joining Waterloo Road and Stafford Street to become Stafford Road. It’s surprising how soon we forget the details regarding these once familiar buildings and this locality but I hope, you find something enjoyable in trying to conjure up visions of the the North Street I once knew. I love your website. I discovered it a few days ago and have been reading the articles ever since. My parents both grew up in Wolverhampton and most of my father’s ancestors came from there. My 3x great grandfather lived in North Street between 1840 and 1881 and it’s really interesting to see the old pictures. His son, my great great grandfather lived in Molineux Fold which seems to have disappeared below the ring road. His daughter, my great grandmother kept the Lamp Tavern in Grimstone Street. 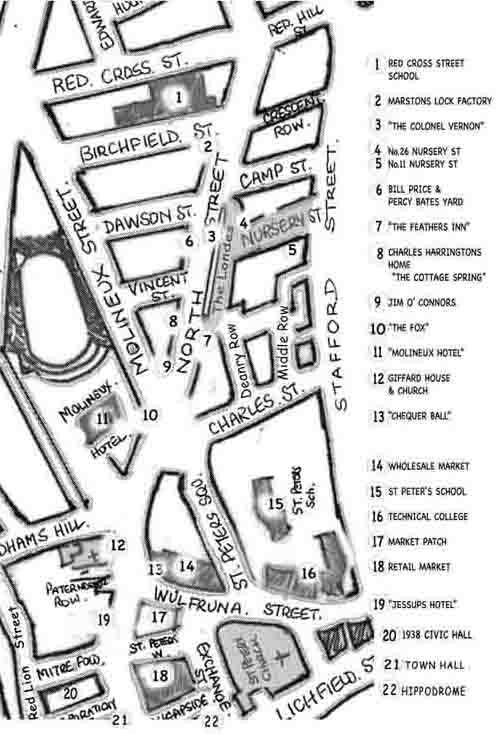 Am I right in believing that Grimstone Street was originally Junction Street? My grandmother Mary Howard (1882-1976) was the daughter of a railway turner who became a clerk. She and her siblings were born in Wolverhampton. The eldest was born in !866 and the youngest (Mary) was born in 1882. 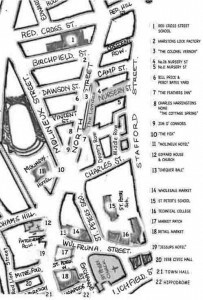 The family started in Otley Street, then by 1874 it was 65 North Road.. In 1877 they were at 3 Stafford Road then 118 Stafford Road in 1881. By around 1900 they were at 204 then 208 Waterloo Road. My grandmother became a teacher – I think she may have been a pupil teacher..perhaps at St Peter’s as I don’t recall that she furthered her career by going on to college but she must have taught for up to a decade, stopping when she married in 1910. After their parents died, the unmarried sons and daughter moved at 10 Francis Street until their old age until well past the middle of the 20th century. All the sons worked as railway clerks. Another aunt, Fanny Harrison,widowed by the Spanish flu epidemic of 1918- 1918, lived alone in a nearby street. I remember visiting my uncles who lived with their sister in the 1950s in their dark, old fashioned house at Francis Street – I loved it! My Aunty Fan used to come by train, well into her 80s, to stay with us – she always seemed happy, told us stories and sang us songs that I remember to this day. One thing I loved was their accents – how much better it was to listen to a story read by my Nanna in her unfamiliar Wolverhampton accent with its different vowel sounds…never forgotten. In 1910 my grandmother had married , my grandfather came from Aldridge near Walsall( but his family had originated in Shropshire) After their marriage they moved down to South Wales where they remained for the rest of their lives. I was born 9th April 1929 at number 13 Oxley Street which went from North Road to Waterloo Road. My Grandma named Barrs ran a general shop at 33 Oxley St. until she was nearly 90. This was next to the Unicorn Inn, an Ansells House. I went to school at Red Cross Street Infants and then Junior and finished up at the Intermediate School in Old Hall Street. I remember a Co-op shop on the corner of North Rd./Oxley St. but this previously belonged to the Hand family who lived in an adjoining house.One of my schoolmates from Red Cross St. was Leslie Pritchard whose parents ran a second hand shop in Stafford Street, opposite Littles Lane (and Copes Motor Cycle shop). I can still remember us careering down Littles Lane on a home made buggy! We certainly had plenty of local characters around the area, one who comes to mind was Harry Lomas whose house was actually in LOMAS St. Harry used to go round selling fresh milk from churns on his milk float handcart and always had jokes and strange tales to relate. This comment is getting out of control so I better stop here but could go on.